We’ve had lots of crazy weather in New York City lately. There was a brief spell with highs in the mid-40s for a week or so, then a kind of a mini-heat wave with temperatures in the upper 70s to low-80s. This week so far, things have gone down again to a more seasonal 55 degrees. It feels appropriately, autumnal. We’re in a brief window of time where there’s some overlap between the end of summer and the depths of autumn. That means, sweet corn, luscious zucchini and tomatoes, an abundance of peppers, pumpkin … and mushrooms. 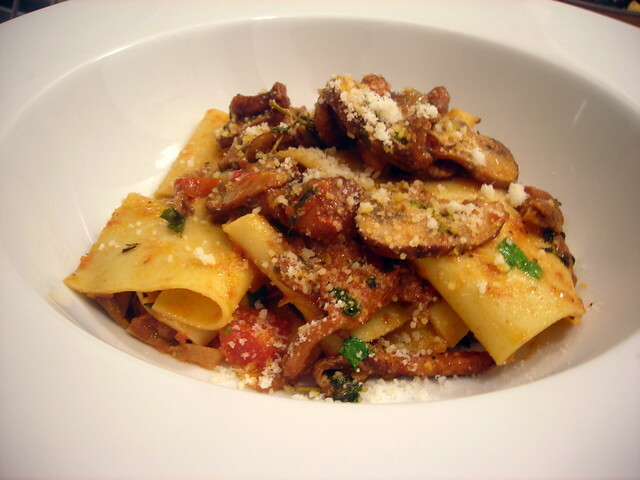 Mushrooms are a seriously favorite autumn vegetable that can oftentimes be substituted for meat. They’re known for their sensation of umami, a flavor that can be translated from the Japanese for ‘pleasant savory taste’. Many foods are rich in umami; besides mushrooms, other foods include cheese, green tea, seaweed and ripe tomatoes. I love mushrooms as prepared simply in dishes ranging from champignons de Paris (mushrooms fried in butter, with a touch of garlic and parsley), duxelles (finely chopped mushrooms and mushroom stems, sautéed in butter along with shallots and herbs, and reduced to a paste, to be used as a garnish or as a filling for a savory tart), or in insalata di funghi. Shall I speak to you of the joy of ricotta gnocchi? Imagine forkfuls of slightly sweet, ultra-creamy morsels of cow’s milk ricotta, gently spiced with nutmeg, alternating with chanterelles and porcini mushrooms fried in French butter. It’s enough to make me swoon. Then, there’s today’s offering: pappardelle con sugo di funghi, or pappardelle pasta (wide noodles) with fresh and wild mushroom sauce. One bite, and you’ll instantly be transported to Italy, all without having to leave your own home. This recipe is adapted from this New York Times article by noted cookbook author and chef, David Tanis, formerly of Chez Panisse in Berkeley, California. 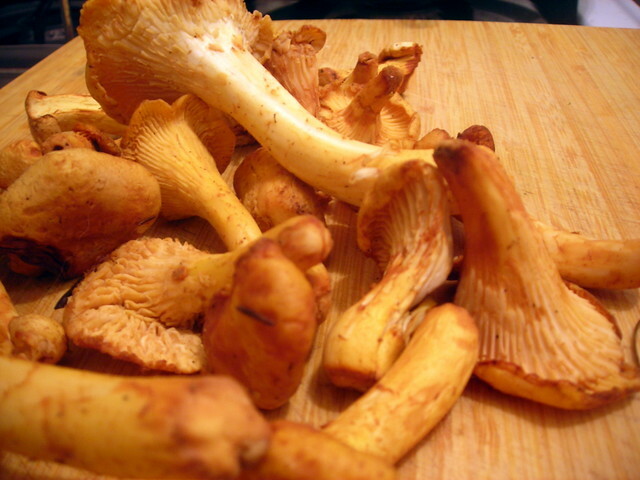 If you don’t have access to chanterelle mushrooms, substitute oyster mushrooms instead or omit them entirely. Clean mushrooms and trim tough stems. Save stems for stock. Slice the mushrooms thinly, about 1/4″ thick. In a wide skillet, warm 2 tablespoons olive oil over medium high heat. Add onion and garlic, season with salt and pepper and cook, stirring, until onion has softened and browned, about 10 minutes. Remove from pan and set aside. Add 1 more tablespoon oil and turn heat to high. Add brown mushrooms and wild mushrooms, season lightly and stir-fry until nicely colored, about 4-5 minutes. Lower heat to medium. Add thyme, sage and red pepper flakes. Mix well, and cook for 1 minute. Season again with salt and pepper. Stir in the onion-garlic mixture and crushed tomatoes. Bring mixture to a boil, then lower the heat to medium-low and simmer for 15-20 minutes, partly covered. Towards the last 3-4 minutes of cooking, raise heat to medium and cook uncovered, or until sauce thickens slightly, stirring occasionally. Taste for salt and pepper. (May be prepared in advance and reheated at this point.) Stir in the Italian parsley. Bring a pot of lightly salted water to a boil. Add the pappardelle pasta and cook for 2-3 minutes, or until pasta is al dente. Drain the pasta, then add it to the mushroom sauce. Toss the noodles gently, then spoon onto warmed pasta bowls. Serve at once, with a little Parmigiano-Reggiano cheese sprinkled on top. This recipe is sized for two people. 10 Oct	This entry was published on October 10, 2013 at 7:31 pm. It’s filed under autumn, food, food photography, Italian food, vegetarian and tagged autumn, dinner, food photography, Italian food, mushrooms, pasta, vegetarian. Bookmark the permalink. Follow any comments here with the RSS feed for this post. Some friends of mine serve this over fried bread that’s been dusted with cheese instead of pasta or polenta.